Nehemiah Griego, the 15 year old boy who is accused of fatally shooting his mother, father, two sisters and a brother in Albuquerque, New Mexico was reportedly not going to stop at that but had plans to keep killing and go to a local Wal-Mart to continue his murderous ways. According to the Daily News, after killing 5 members of his family, Nehemiah Griego told a friend that he was going to continue his killing spree by going to a local Wal-Mart. Griego loaded up his family van with “several” guns that he intended to use to slaughter customers at the nearby shopping center. Thankfully his friend talked him out of it and he eventually told a church security guard about the crime, and the retired cop called 911. 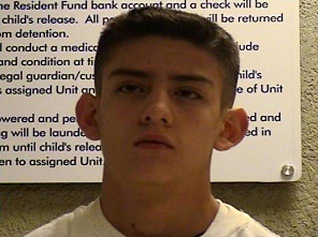 Nehemiah Griego was arrested and charged with two counts of murder and three counts of “child abuse resulting in death”. The motive for the horrific slayings were still unclear, but it is being reported that the home-schooled 15 year old teen had had a “minor disagreement” with his mom Sarah Griego Friday night. This is what causes a kid to kill 5 of his own family members, a disagreement? What have we raised for children when they cannot cope with the word “NO”? Once again we are witness, similar to the Sandy Hook Elementary shootings in Newtown, CT of a kid using his parent’s guns to kill them. According to reports the guns were not kept in a gun safe or locked away, but instead in a closet. The New Mexico teen accused of gunning down his younger siblings, his mom and his pastor father reportedly planned on continuing his killing spree at a local Walmart. Nehemiah Griego, 15, had loaded up his family van with “several” guns that he intended to use to slaughter customers at the nearby shopping center, the Albuquerque Journal reported Monday. Griego hoped to die in a shootout with cops, sources told the paper. But he was talked out of the plan by a friend, who convinced him over the phone to meet him at his father’s church, the paper said. He eventually told a church security guard about the crime, and the retired cop called 911, the report said. The motive for the horrific slayings were still unclear, but the paper said the home-schooled teen had had a “minor disagreement” with his mom Sarah Griego Friday night. At around 1 a.m., the gun-toting goon crept into his mom’s room and shot her, the report said. The shooting woke up Griego’s 9-year-old brother Zephania, who’d been in bed with the mom. Griego told the boy what he’d just done — and then shot him “multiple times,” the report said. The sounds of violence roused Griego’s 2- and 5-year-old sisters, Angelina and Jael, who started screaming before their big brother killed them, too. Griego then laid in wait for his father, pastor Greg Griego, and gunned him down when he walked in around 6 a.m., the report said.